Generally when finishing, there are two rules of thumb. 1) When going for power, we want to use our laces so that we can get a solid strike on the ball. The reason for this is that the top of your foot is the biggest hardest surface (specifically above the first metatarsal which makes your big toe) and when you strike that through the middle of the ball using the other body mechanics then you will be able to make a good, clean, and powerful strike on the ball. 2) When trying for accuracy and placement we should use the inside of our foot as if we were passing the ball into the goal. As a warm-up we look at an opportunity for players to take a touch and control their own shot. Here players will start on one of the red cones, will take a touch into the danger (marked out by blue cones) and must have a strike with their laces trying to get the ball on frame. Here is what we need to focus on. This is a competition, 1 pt is scored for a ball going into the goal that hits the net in the air. 3 pts are scored for a ball that hits the net in the air, but goes into the corners inbetween the post and the pole added there. Games should last about 2 or 3 minutes depending on numbers so now we have pressure added because of the time constraint. 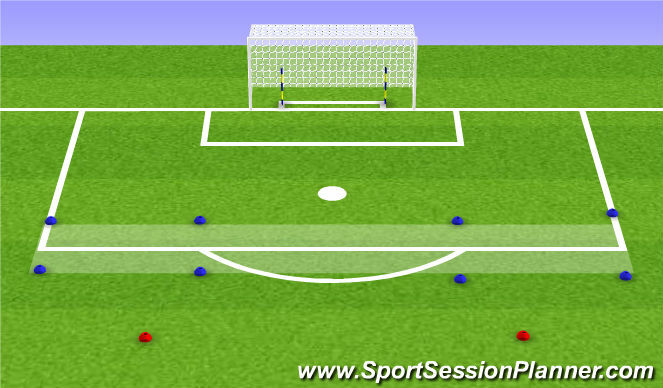 This exercise is similar to the other except that in here the player only has two touches to take the shot. 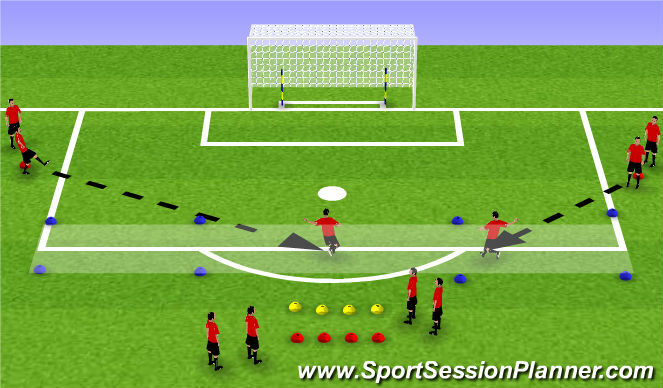 - The player will begin by performing footwork over either the red or the yellow cones. - Any agility footwork will do. - After the agility work, the player will ask for a pass into the danger zone and will have two touches to get the shot off. Will need a positive preparation touch to set them up for their next touch which should be a shot. - Looking for the same techniques as exercise before. There is the added issue of having traffic so touch needs to be taken towards goal but away from the other person working. - After shooting the player becomes the passer and and passer goes to the end of the line. 1) to work quicker we will need to start with two passers at the beginning of the exercise. This game is played in a space of about 20 to 25 yards which is roughly the size of 2 penalty areas. 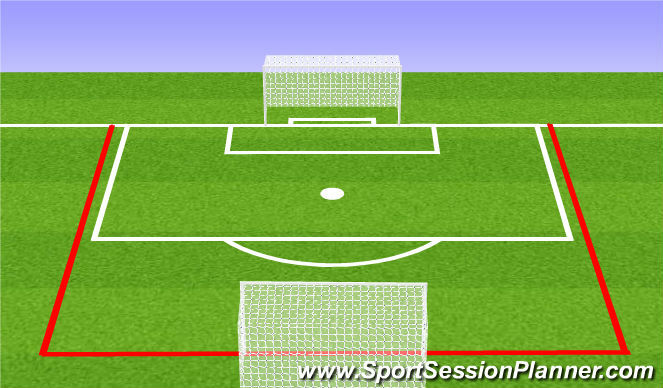 - The game is played with no restrictions, but the size of the grid encourages the players to take many chances on goal. - The games need to be played at a high tempo with space so split the team into 3 groups of 4 one team will rest. This game can also be played with goalkeepers, in that event you can adapt the numbers however is best. - The second part of the high tempo is the time of the games. If the games are 3 groups of 4 then the games can be 3 minutes and just rotate one team every time. If not, then play 3 minute games with a 2 minute rest period.